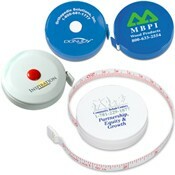 • Round ABS plastic case with 5 ft.-long PVC fabric measuring tape with cm and inch scales. • Includes an auto-lock with retraction button. • Featuring the option of VibraTecSM - Prime Line's latest brilliant four-color process imprinting, available for an additional fee.